Product prices and availability are accurate as of 2019-04-14 01:09:58 BST and are subject to change. Any price and availability information displayed on http://www.amazon.co.uk/ at the time of purchase will apply to the purchase of this product. 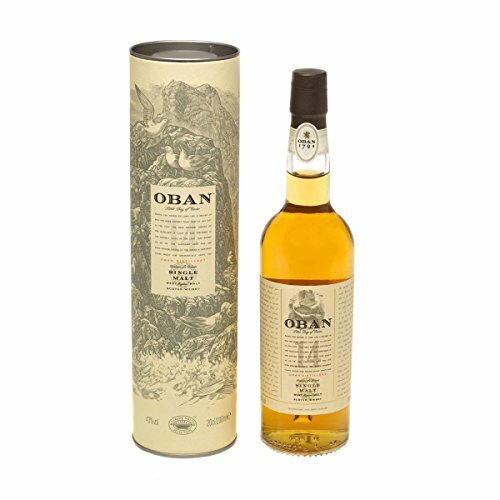 Oban is a bustling seaside resort and has grown up around the distillery in the two centuries since it was first built in the fishing town of Oban. The West Highland malt is still produced in the same unhurried, traditional fashion and this 14 year old is a classic dram from the distillery. Case of 6 ABV: 43% Scotch Malt Whisky from the Highlands of Scotland Savour it neat, on ice, with a mixer or in a cocktail. It is an offence for any person under 18 years to buy or attempt to buy alcohol. Please drink responsibly.